For many of us ironing is one of the most boring things about modern life, it’s up there with being kept on hold, queuing in the Post Office and party political broadcasts. But it would seem it is a necessary evil, so it’s good news that Brabantia have developed a range of accessories to make ironing slightly less of a chore (I was going to say “enjoyable”, but they’re not miracle workers). The m etallised cotton cover reflects heat which makes ironing faster, easier and more efficient. Always combine this cover with Brabantia’s resilient viscose layer, which can be cut to size, to optimise your ironing comfort. 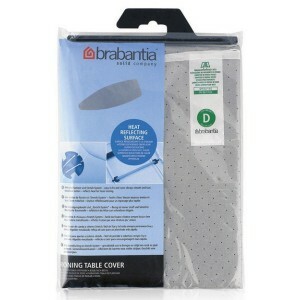 Suitable for standard or steam ironing and available in 5 sizes to fit all Brabantia ironing boards. Included with the cover is a cord binder to ensure the drawstring keeps the cover tightly fitted and a Stretch-System band which will keep the cover taut and crease-free. For sensitive, delicate fabrics, such as silk or nylon, Brabantia’s protective ironing cloth provides a barrier between the iron and your clothing which prevents shiny marks from the heat of the iron, whilst still allowing you to see where you’re ironing. The protective ironing cloth is also useful for garments that have prints on them, such as screen-printed T-shirts or workwear with a printed company logo on. For perfect, crease-free shirt sleeves, the Brabantia sleeve board is the bee’s knees. It’s steam permeable surface and foam underlay make it suitable for standard or steam ironing. The 60cm x 10cm ironing surface pops up from its frame and can be used on top of your full size board or on any stable work surface. When it’s not in use the sleeve board can be hung up out of the way with its integral hanging loop. Fans of the American sitcom The Big Bang Theory will no doubt recall mad scientist Sheldon Cooper meticulously folding his laundry with a board like this one! It’s the perfect accessory for folding shirts, T-shirts and jumpers uniformly and without creases for a well-organised wardrobe. The board has easy-to-read folding instructions on both sides. When it’s not in use it can be hung up in the wardrobe alongside your perfectly folded clothes. Store your iron away neatly when it’s not in use (or when you need a break from the ironing) with Brabantia’s heat resistant iron store. 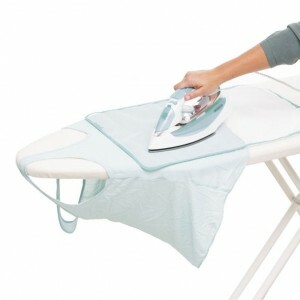 It’s suitable for all steam irons and is made from heat resistant materials so that you can put the iron away even when it is still warm. 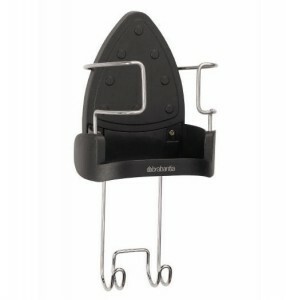 It also has a handy holder for the flex and a sturdy steel hook that will hold any Brabantia ironing board. Another storage option is Brabantia’s heat resistant iron cover, which adjusts to fit any iron and will protect the iron as well as its surroundings. Brabantia, Iron Holder, Ironing Board, Ironing Board Cover, Laundry Folding Board, Protective Ironing Cloth, Sleeve Ironing Board. Bookmark. The Ultimate Festival Survival Kit!